Klaine<3. klainee. Wallpaper and background images in the glee club tagged: 2012 michael glee season 3. This glee photo contains kacamata hitam, nuansa, warna, setelan jas untuk bekerja, and setelan bisnis. There might also be berpakaian orang, jas, celana jas, celana panjang, orang berpakaian, and perapi celana. 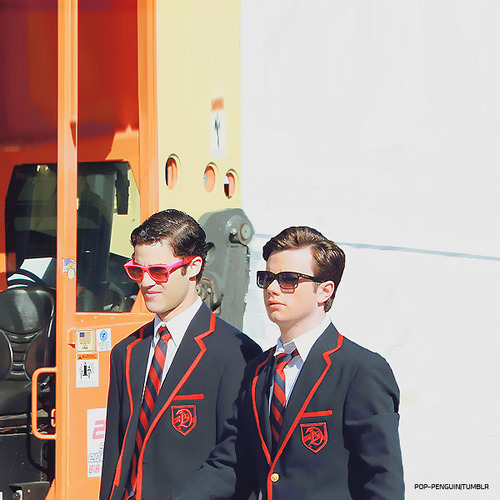 If this is from Michael/Season 3, why are they both in their Warblers'/Dalton uniforms? Kurt in a Blazer at all has to be Season 2 because he returned to McKinley just before the end of the season and joined them in New York for nationals. And, Blaine transferred to McKinley before the Michael episode; that was the episode Sebastian threw the loaded slushee in his eye. The maturity of Chris's face/head changed between seasons, too; there's more space between his jawbone and cheekbones, now, so his cheeks are a little more hollow and he doesn't have *quite* as much of a baby face as he used to. He'll probably still get carded for a while though, poor guy.